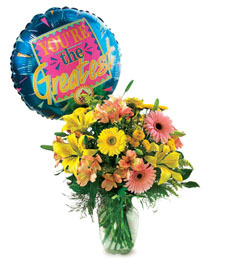 Flower.com: You're The Greatest Bouquet and Balloon! You're The Greatest Bouquet and Balloon! When you can't keep it to yourself any longer, send this blooming bouquet and send your thoughts loud and clear - You're the Greatest! Never hide your feelings, be free to express whatever your heart desires to that special someone. An array of bright shimmering blooms and a mylar balloon will communicate the occasion!